Dec 8, 2017 ~ Winter finally started in South Texas last Tuesday in the form of a front bringing gusty winds, lowered temperatures and quite a bit of rain. Just before the change we were in Galveston hunting for Sandhill Cranes - without a lot of luck. We ended up on a reliable favorite: Sportsman Road. The tide was very low which left the mud bank exposed; perfect for waders to hunt crabs. You know where Sportsman Road is, don't you? Great place for birding, both with binoculars and cameras. The inland marsh is always surprising. 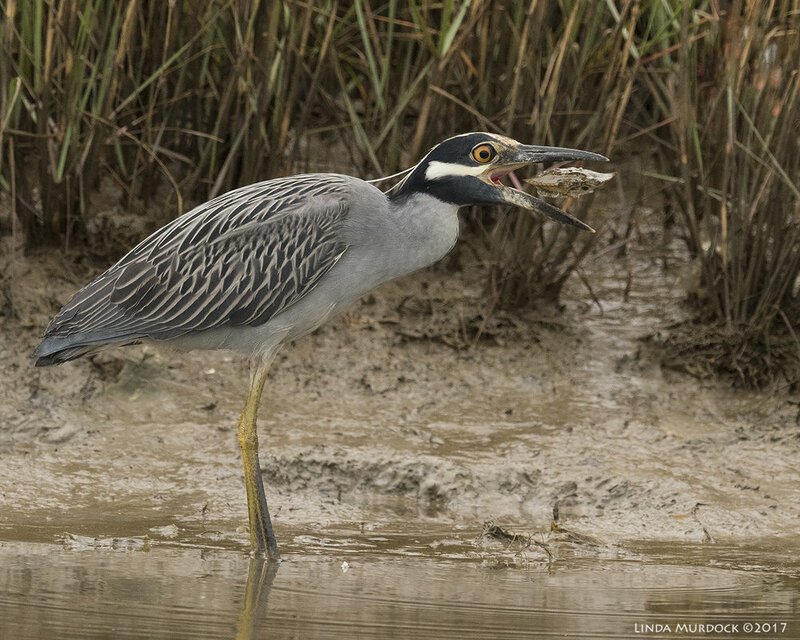 This time we saw a dozen or so Yellow-crowned Night Herons. We usually just say "Yellow-crowns" but birders will write it "YCNH". Most were adults but earlier in the year you can spot plenty of juveniles. One year, a salt-cedar bush by the side of the road was a resting place for a bunch of barely-out-of-the-nest youngsters. Most of the YCNHs were just standing there. I mean, they don't move for the longest time and you can slow your shutter speed waaaay down... except you never know when they will do a major fluff-up and you need a bit of speed to catch that. Even when they start stalking, they don't move too fast. This fella is very attractive and sports a fine top-knot of white plumes. Their bill is heavy and strong; perfect for crunching crabs. One hopped up on an old fence post and gave this tremendous yawn. That structure at the back of his tongue is normal; it helps to manipulate food for swallowing. In case you want to know even MOAR about bird's tongues, check out this article by Nancy E Johnson (pdf warning): The Avian Tongue. That lovely bokehed background comes from the marsh grass in the distance. One of the easiest ways to get a smooth background is have your bird perch on a post with nothing close behind him. We could see rain showers on the horizon so we tried a few other areas ahead of the front, but nothing much was moving and we came back to Sportsman Road. This guy was having a lot of difficulty keeping a small eel down. You can see his nictitating membrane is protecting his eye as the food thrashes about trying to escape. Bill Maroldo set up his tripod and crate down in the mud, but I was following a Willet on the other side of the road. And then he hollered "He's got a crab!" I got back in time to see the YCNH moving along the shore with a pretty big crab. They will take their prey to a safer place for eating; no need to risk dropping in the murky water to escape..
Yellow-crowns will methodically remove the claws and all the legs from the crab. This is tricky as the crabs will often "give up" a claw in an effort to escape. One large claw has already been broken in this shot. Note his eye protection is in place. He continued to manipulate and turn the crab which make up a large part of their diet. They will also eat crawfish, as well as insects, some fish or worms. It will also feed on lizards, small rodents and small birds. A couple of times we saw him drop the crab on the mud and then stab the body. Note the hole right through the center of the legless crab. Whew. I was lucky he stayed roughly parallel to me and didn't turn at an angle to dismember the crab. Most of these were shot at f/6.3 or f/7.1 - it was dark, so ISOs of 1600 and 2000 were needed. Mostly I was worried about the trash in the marsh and on the banks. He would move a foot or two either direction while working on his dinner. There were two rather large messy piles in the grass but thankfully they showed up around the edges so I could remove them with Photoshop. 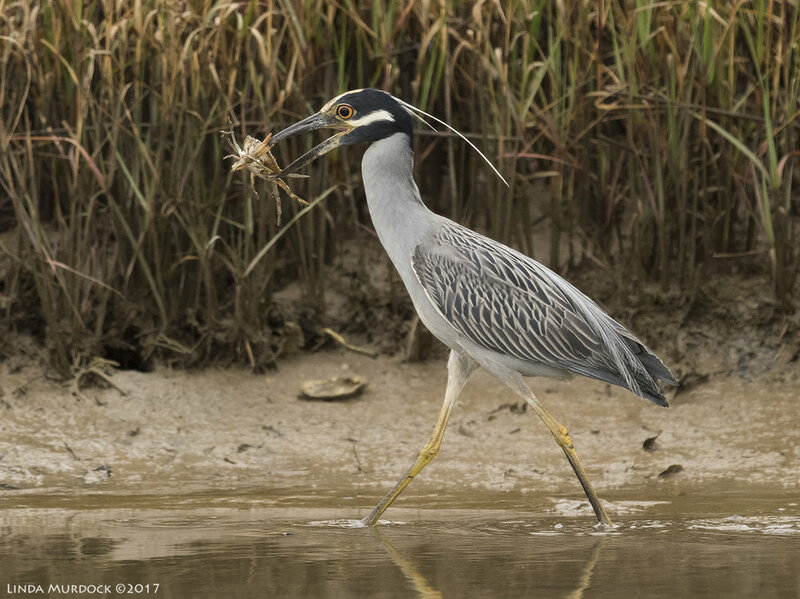 The Yellow-crowned Night-Heron occasionally nests in low shrubs on coastal barrier and dredge-material (spoil) islands, but, its usual breeding habitat includes forested wetlands along rivers and creeks, swamps, bayous, and urban wooded areas in deeply shaded areas. There are a few dense clumps of trees at the edges of pasture land on the West End of Galveston. They will start courting and nesting in March so it wont be too long now. Do they nest in your neighborhood? 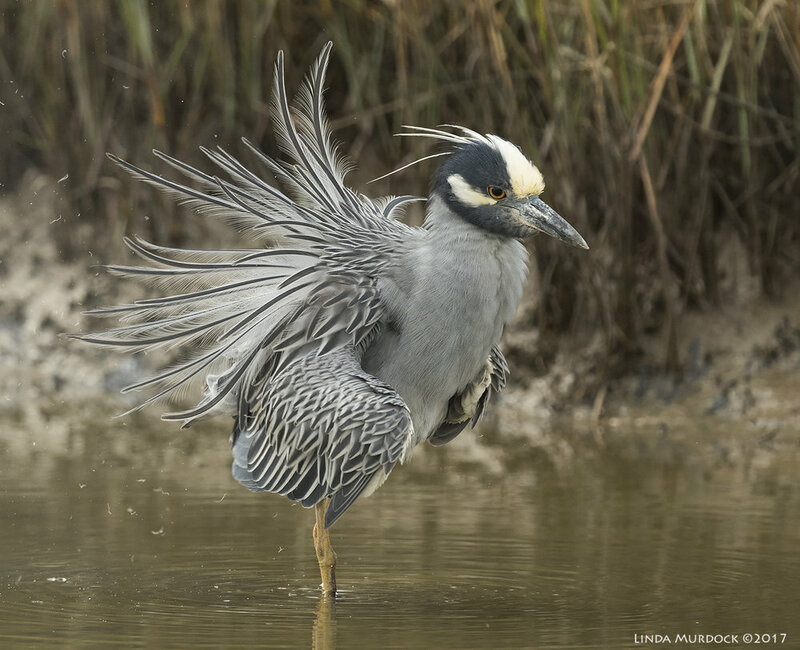 Do you ever see Yellow-crowned Night Herons hunting crawfish in the ditches along city streets? Let me know in the comments below! Update: Hope you got up early enough to see the snow in South Texas this morning! Nothing like snow on palm trees and crazy drivers on icy freeways. This adventure was written before this earthshaking traumatic event (first snow here since 2008).